Thank you for joining me as we count down to the MFT release. We are five days away from the big day! All the new Stamps, Die-namics, and Stencils will be available on Tuesday, November 1 at 10:00 pm EST. Be sure to check out the MFT Blog to see all the new items being revealed today. Don't forget to leave a comment on the MFT Blog countdown posts, YOU could win one of the five $75.00 gift vouchers. I have a couple of cards to share with you using the new Chill Wishes stamp set and Die-namics, the Downhill Slope Die-namics, and the Stitched Rounded Rectangle Frames Die-namics. You are going to LOVE the Chill Wishes set! It is full of fabulous images and sentiments. I stamped this cool penguin on X-Press It card stock and I coloured him with Copics. I placed him on a Spin & Slide Disc and he will slide on down the hill. My next card features another sweet little penguin in the Chill Wishes stamp set. Isn't he cute? I created this fun little shaker card using the new Stitched Rounded Rectangle Frame Die-namics. LOVE these new dies! Julie, Such cute Penguin cards! Love the glittered frame! 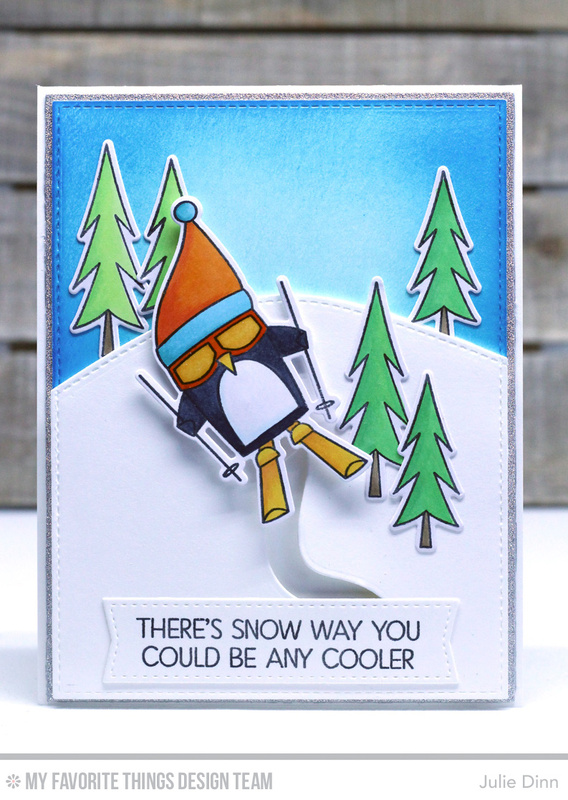 Two awesome cards- great skier penguin and an inspired snowflake shaker, too! I cannot wait to send this to my sister in FL! Thanks. Super projects. Love the shaker card especially. Your cards are so cute! I love them both. Both cards are adorable. The penguin in the shaker, looks like he's shivering in the cold. Fun cards, Julie! Thanks for sharing.